The Jackpot Collection by Catnapper offers fabric theater seating available in five colors: Bitter, Cloud, Lapis, Scarlet, and Steel. The chairs come with either manual or power reclining mechanism, they can be used independently or bunched together to create a multiple chair rows. 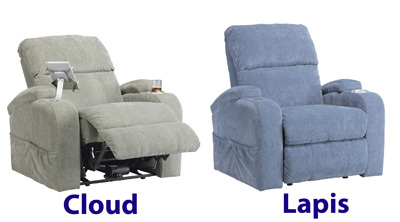 Each recliner is provided with iPad claw in one arm and lighted and cooling cupholder in the other arm. 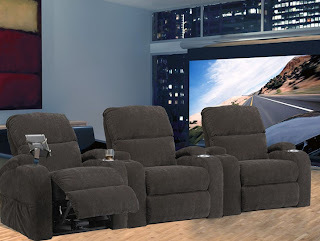 Additionally, the recliners feature magazine pockets and are upholstered in Infinesse Fabric which is an extremely soft yet most durable and cleanable fabric on the market. If you desire to introduce casual style and unsurpassed comfort into your home, the Jackpot Collection is the solution.